As You Sow advocates for companies to adopt best-practices that protect pollinators. Cross-pollination helps at least 30% of the world’s crops and 90% of wild plants to thrive. Pollinators, especially bees, are rapidly disappearing in Europe and North America, a loss that threatens food security and entire ecosystems. Scientists regard the overuse and misuse of pesticides as one of the main factors contributing to the decline of pollinators, along with global warming, parasites, and habitat loss. Following engagement with investors and advocates, General Mills has become the first major packaged foods company to improve policies to protect bees and other pollinators from the impacts of pesticides. A shareholder resolution filed by As You Sow and Clean Yield Asset Management was withdrawn after the company agreed to update its Global Responsibility Report with a commitment to support the White House’s Pollinator Health Task Force strategy. Many of the crops that General Mills buys depend on pollinators. By investing in supply-chain sustainability, General Mills is ensuring the future of its supply chain and its profitability. To reproduce, many plants require the help of another organism (called a pollinator). 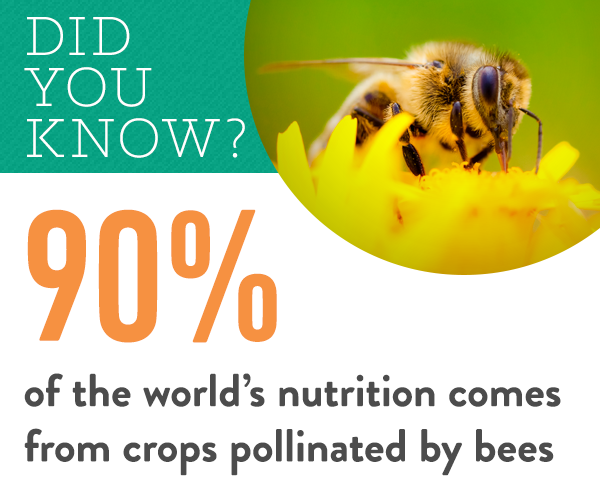 Thirty percent of the world’s crops and 90% of wild plants reproduce with the help of pollinators. Pollinators include honey bees, bumblebees, a variety of flies, butterflies, moths, and beetles. Some plants are also pollinated by birds, bats, or other mammals. Since 2006, researchers estimate that nearly one-third of all honey bee colonies in the US have vanished. This crisis, called Colony Collapse Disorder, threatens the stability of the global food system. Neonicotinoids (“neonics”) are a class of insecticide linked to pollinator decline and other negative impacts to soil and water (according to the U.S. Geological Survey and the International Union for Conservation of Nature). The overuse and misuse of neonics is regarded as one of the main factors contributing to bee colony collapse, along with global warming, parasites, and habitat loss. Over the past decade, neonics have become one of the most widely-used insecticides, accounting for roughly 25% of the global agrochemical market. The prevalence of this insecticide in agriculture, compounded by its ability to persist in soils and become mobile in waterways, further magnifies risks. In December 2013, the European Union enacted a two-year ban on three neonic products. Unfortunately, U.S. regulators have not acted as rapidly, despite the critical nature of the problem. In June 2014, President Obama established a Pollinator Health Task Force charged with “understanding, preventing and recovering from pollinator losses.” In July 2014, the United States Fish and Wildlife Service announced plans to restrict neonic use across the Wildlife Refuge System. In the meantime, companies can play a significant role in reducing the impacts of these pollinator disruptors. Whole Foods’ Responsibly Grown Rating System will limit “best” ratings to those suppliers that prohibit the use of four neonics. Home Depot is working with suppliers to phase out neonics on live plants. Lowe’s will phase out neonics as suitable alternatives become available.